2.Using big 6PIN in interface adapter to strengthen power supply, and release motherboard from Graphics Card power supply. So, when connected with multiple Graphics Card, it will reduce the burdens of motherboard. 3.Using on motherboards which have multiple cards being run simultaneously. 4.Making the mining machines free from each other. 5.Working great for Bitcoin , Litecoin , Dogecoin, and other cryptocurrency mining , running multiple video /GUPS cards for better clearance and cooling . 4. With solid capacitors, making graphics power supply more stable and secure. 5. USB 3.0 cable, 30cm long enough for the mining machine,more convenience, more durable,more freedom. 6. 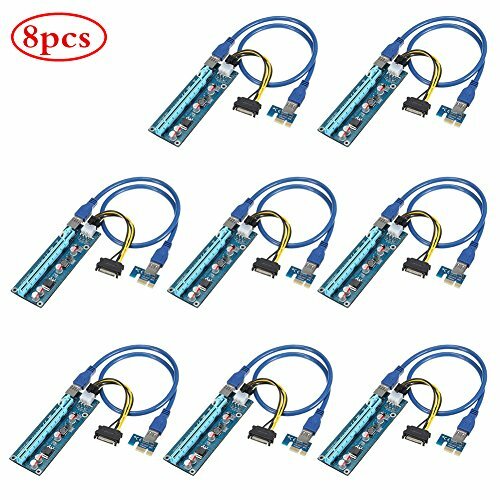 With SATA 15pin Male to Molex 6pin power cable, more powerful, and reduce the burden of the motherboard. 7. Lower temperature, more effective, more stable. 8. Provide extra power suppy for PCI-e video card. 9. 2 layer PCB board design. 10. PCI Express Specification version 1.0 compliant. With 3x FP Solid Capacitors, Making Graphics Power Supply, more Stable and Secure. Compatible with 1x,4x,8x,16x PCI-E slot of the motherboard.